Gijsbert Werner, Postdoctoral Fellow and Stuart West, Professor of Evolutionary Biology, both in the Department of Zoology, explain the process of plant cooperation, in relation to their new study published in PNAS, which has shed light on why cooperative relationships breakdown. Unseen to most of us, almost all plants form below-ground interactions with beneficial soil microbes. One of the most important of these partnerships is an interaction between plant roots and a type of soil fungi called arbuscular mycorrhizal fungi. The fungi form a network in the soil and provide the plant with soil minerals, such as phosphorus and nitrogen. In return, the fungi receive sugars from the plant. This cooperation between plants and fungi is crucial for plant growth, including of many crops. Plants sometimes even get up to 90% of their phosphorus from these soil fungi. In collaboration with a team of international researchers, we set out to better understand plant cooperation. We wanted to know why some relationships of plants with soil fungi flourish and others collapse. This involved analysing a large database of plant-fungal interactions containing thousands of species and using computer models to reconstruct the evolutionary history of the partnership. We found that despite having successfully cooperated for over 350 million of years, partnerships among plants and soil fungi can break down completely. Once we knew that that plant-fungus cooperation could fail, we wanted to understand how and why the relationship breaks down. We found that in most cases the plants were replacing the fungi with another cooperative partner who did the same job, either different fungi or bacteria. 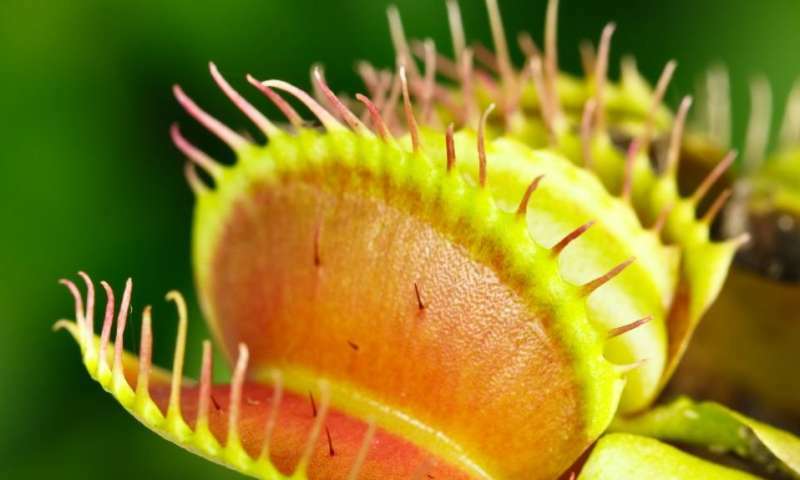 In the other cases, plants had evolved an entirely different way of obtaining the required minerals – for instance, they had become carnivorous plants which trap and eat insects. Our study shows that despite the great potential benefits of the relationship, cooperation between plants and fungi has been lost about 25 times. It is quite crazy that such an important and ancient collaboration has been abandoned so many times. So why did this happen? One explanation is that in in some environments, other partners or strategies are a more efficient sources of nitrogen or phosphorus, driving a breakdown of previously successful cooperation between plants and fungi. For instance, carnivorous plants are often found in very nutrient-poor bogs. Even an ancient beneficial fungus, specialised in efficiently shuttling nutrients to their partner plants simply cannot get the job done there. So, plants evolve a different way to get their nutrients: trapping insects. A next step is to now find out in what conditions the various different nutrient strategies are found? Where on our planet do plants keep their original fungi? Where do they go for another solution to get their nutrients? Other work focuses on the potential that some fungi evolve to become 'cheaters' - taking the benefit from the partnership but no longer contributing to it and ultimately driving its breakdown.